This casual-contemporary accent chair will bring unique style to your home's decor. The silhouette is elegant and sleek from the reversed camel back to the thin, flared arms. Nail head trim outlines the outsides of the arms while thin, tapered legs complete the piece. 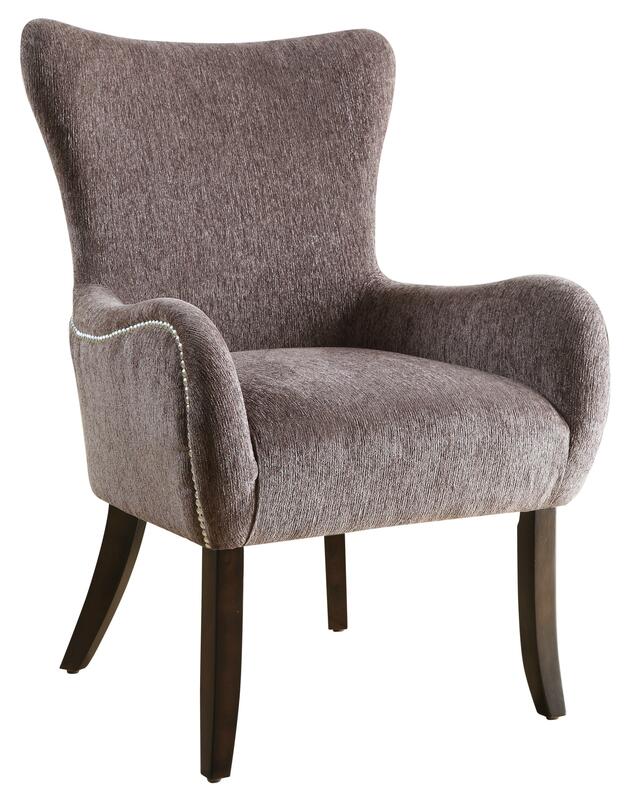 Use this chair in casual and contemporary family rooms, living rooms and bedrooms for a fun accent. The Accent Seating Casual Accent Chair with Contemporary Curves by Rooms Collection Two at Rooms Furniture in the Houston, Sugar Land, Katy, Missouri City, Texas area. Product availability may vary. Contact us for the most current availability on this product. Arm Low set slanted arms with a casual-contemporary style. Seat Back Tight upholstered seat back with reverse camel effect. Seat Tight upholstered seat cushion for firm sitting comfort. Leg or Skirt Long, lean legs with a simple, casual style in dark finish. KD Leg Assembly. The Accent Seating collection is a great option if you are looking for Mid-Century Modern Casual furniture in the Houston, Sugar Land, Katy, Missouri City, Texas area.